The Govt. of Uttar Pradesh has launched a new loan scheme named the SYSY scheme under the leadership of Hon’ble Chief Minister Akhilesh Yadav. 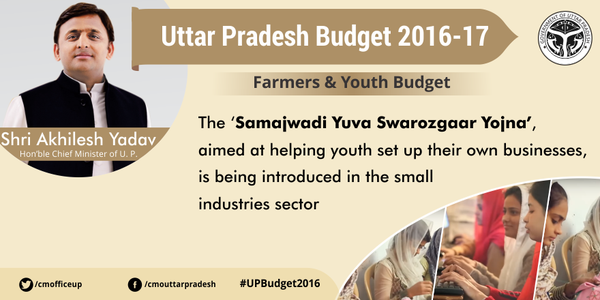 The SYSY scheme is a loan scheme which aims to fight the burning issue of high rate of unemployment in the state. Uttar Pradesh is one of the states in the country with very high rate of unemployment. Hence SYSY scheme is a credit scheme which will provide easy financial support to the micro traders and unemployed youths who either want to grow their existing small scale business or to start a new one. The scheme name itself says self-employment for youth. The scheme is clearly a flagship project of the present Samajwadi Govt. to return to power for the second consecutive time, as the assembly elections are knocking at the door. A string of similar schemes has been already launched by the Samajwadi Govt. in the state like the pension scheme, insurance policy, health benefit scheme, etc. The UP Govt. will provide easy and affordable loans to the small businessmen and unemployed citizens of the state under the Swarojgar scheme. A maximum of 25 lakh loan can be availed by the eligible beneficiaries of the scheme. This huge corpus can be taken on credit from the state govt. and can be utilized either to open up a new trade idea or to reconstruct and modify the existing small scale business. This will result in growth and creation of more income for those small scale business parties, as well as will be a great employment opportunity generation tool. The startups and entrepreneurs will find it very helpful to get financial support to grow their business. This credit scheme is an innovative approach taken by the Uttar Pradesh Govt. to deal with the unemployement issue of the state and to score better in the upcoming elections. Under this loan scheme, the state govt. will provide credit to those beneficiaries who already have Rs. 1 lakh in possession. A maximum of Rs. 25 lakh can be sanctioned under the project. Hence, those with a little amount of capital and a bigger dream can start their own business or follow the path of entrepreneurship in the state. There is also a set of eligibility criteria for the beneficiaries stated under the scheme, for example, the applicant must be a formal education and basic business skills. There will be special benefits for the special category beneficiaries. The Uttar Pradesh govt. has set some eligibility guidelines for the new loan scheme which aims to provide financial aid to the small scale businessmen and entrepreneurs and generate employment in the state. To join the credit scheme, the applicants must have a little capital in hand. All beneficiaries must have in possession with Rs. 1 lakh capital before hand to get the loan. All the applicants must be domicile of Uttar Pradesh only. The minimum age of eligibility to join the scheme is 18 years where as the maximum limit up to which one can apply for the scheme is 40 years. This scheme can be joined for only once and only one member can join the scheme for once and multiple applications is not allowed. If an applicant has already applied for a state govt. credit scheme, then he/she is not eligible for this scheme. Multiple applications to the scheme will lead to cancellation of application. One household or one family must not have more than one application for the loan. Also another important condition is that, if an individual or party has already been declared as a defaulter by any bank or financial institution, then he / she cannot apply for the Swarojgar scheme. After the small businesses get to have necessary modifications using the state financial aid and make expansions, then there will automatically a huge scope of generation of employment. Also the startups who can utilize the state funds in setting up their business can give employment to the needful and skilled youths. A simple projection states that is each beneficiary create job opportunity for 50 average unemployed youths then there will be a total of 50,000 employments in the state per 1,000 beneficiaries. Although the loan scheme by the Uttar Pradesh govt. aims to resolve the unemployment issues in the state. There are some concerns about the sustainability of the scheme. The scheme might look great on paper but actual implementation of the scheme at ground level might be difficult. The main concern is the initial condition given that the applicants must have initial possession of Rs. 1 lakh capital. In rural areas, most of the micro traders do not have in possession of Rs. 1 lakh capital to join the scheme. Though, it will be easier for the urban applicants to accumulate the amount. Also there is another hindrance of the scheme which is the essential requirement of applicants to have 10th standard education and have business skills. Most of the micro traders, craftsmen, farmers, etc. do not have this essential educational qualification, thus barring them to get the loan benefit from state govt. Also, the startups might find it difficult to gather business skills and practical knowledge which is also essential for the scheme. Thus, sustainability and feasibility of this scheme is a big factor. The Govt. has declared that it is going to screen the applicants for the loan project and sanction them loans only if they fulfill the minimum educational qualification and business skills or knowledge. One must be a 10th standard pass out to join the scheme get loans. There will be screen sessions of the applicants where authorities will examine the business skills and practical knowledge before approving the loan. They must be well aware about the scope of the business they are performing. They must also project about the employment generation scope through their business. The state govt. will have 90 per cent share in providing the margin money. For the small scale industries, the margin money can be up to Rs. 6.25 lakh. Whereas, for the service industry, the maximum margin money will be Rs. 2.5 lakh. Hence, a scheme like this with some minimum criteria is a big scope for the micro industries and entrepreneurs to grow their business by taking loans from the Uttar Pradesh govt. There is a special facility for the applicants who belong to special categories like Scheduled Castes, Scheduled Tribes, PWD, economic weaker sections, religious minorities, etc. General applicants are required to make contribution of 10 per cent of the loan amount. Whereas, the applicants of special category will be provided credit if their contribution is 5 per cent of the corpus.